Hi, I'm from Seto City in Aichi Japan. After graduating from Kansai Bible Institude (KBI), I worked at churches in Aichi and Fukui for several years. Then, I worked for people with mental disabilities at a big care centre in Kasugai City for 13 years. In 2003, my family and I moved to Portland, Oregon in the United States to do Japanese Church Plantings. I was trained at JIBC（Japanese International Baptist Church) under the leadership of Rev. Mike Yokoy. In 2004, along with my family, I then moved to Calgary, Canada to be a Japanese Speaking Pastor at Calgary Japanese Gospel Church. After 4 and a half years of ministry there, I started a small house church in November 2008. We named our new church "Crossover Japanese Church of Calgary (CJCC)." 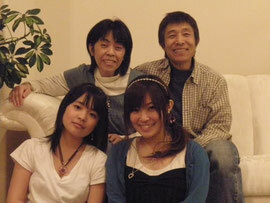 In January 2010, we started our Japanese Worship Service at Westview Baptist Church. So, if you are looking for worship in Japanese, learn The Words of God, or wishing to make great new friends, please join us at Crossover Japanese Church!